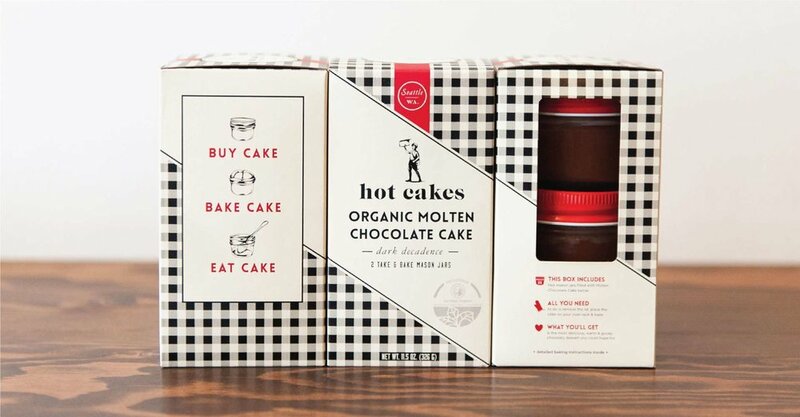 HOT CAKES | CREATIVE RETAIL PACKAGING, INC. Hot Cakes Molten Chocolate Cakery located in Seattle, WA crafts organic, classic American comfort desserts and innovative confections. Founded in 2008 by Autumn Martin, the restaurant is named after its signature product: “take ‘n bake” molten chocolate cakes. CRP helped to create a cohesive brand impression through product packaging, marketing collateral, and storefront design. Utilizing a consistent “sash” element inspired by the newsboy’s messenger bag, each product line is differentiated by unique patterns and a rich color palette to harmoniously convey an earthy, yet high-end aesthetic.